Location One invited me to do a version of Slowscan Soundwave (II) in their main gallery. 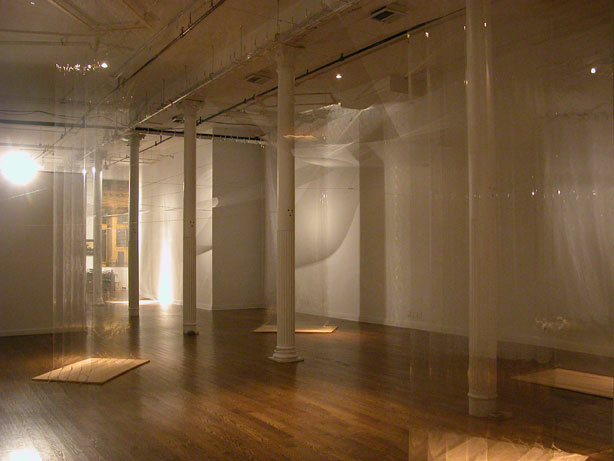 There are five 15' tall columns of transparent mylar strips hanging from the ceiling and two long swoops of mylar cutting a V across the room. Mounted in two corners and on one column are sound-activated motor mechanisms, each of which vibrates two of the mylar elements. The motors are connected to the mylar elements via long lengths of twine that ricochet around the room from motor to mylar through a sequence of pulleys. A loud sound causes a motor to turn, the motor tugs on the twine, the twine transfers energy across the room via the pulleys and ultimately gently pulls on a mylar strip. Lights are focused on the mylar so that water-like reflections and shadows are cast on the gallery walls, causing delicate ripples and distortions when sounds are made. Slowscan Soundwave (III) continues exploring the idea of making difficult to perceive phenomena a little more perceivable, while attempting to preserve some of the the subtlety and beauty that make the phenomena compelling in the first place. Here I was thinking a lot about the way sounds travel, and in particular the idea that when a sound happens in one place it has repercussions throughout the space. So when a truck goes by the front window and makes a BANG! as it bounces over a pothole it not only changes the air pressure where human ears are listening, but also causes vibrations in the remote corners of the room. The zigzagging twine connections between motors and mylar, and the placement of the motors as far as possible from the mylar they're vibrating, are attempts to get at these ideas. Slowscan Soundwave (III) was installed at Location One from 11 October - 26 November, 2005 as part of Slowscan Soundave (III) & The Telaesthetic Finger, currated by Heather Wagner. Special thanks to the crew at Location One for their support and encouragement!